I love recipes. I collect them, I read them, I cook them and more often than not I tweak them! Not always of course and not when I am baking, but cooking is not an exact science and I believe that one can definitely change things around a lot to suit one’s taste/budget/season etc.. I was therefore delighted with this term’s CTB pick Outlaw Cook, by John Thorne (hosted by Rachel of Crispy Cook) who strongly believes we should not be enslaved by recipes or food writers, but try to find our own voice in cooking. Published in 1994, the book is a collection of essays mostly written for his newsletter Simple Cooking which he writes with his wife Matt (note: I thought Matt was a guy for a long time, but then I read the introduction and really laughed at my mistake 🙂 ) about everything from mushrooms to Martha Stewart in a way which strongly reminded me of blogging: personal, highly informative and not afraid of strong opinions. Although sometimes the amount of academic information on a single ingredient could be cumbersome for the tired mother of a 2 year-old (me), I thoroughly enjoyed this book and found myself agreeing with the author on so many things like for example his disdain on the 4oz portion of pasta (I usually make 12oz./350gr for me and my husband, if pasta is our main meal, but the same amount serves 4 people when it is a side for meat with sauce) or that food writers, chefs or anyone writing recipes (and one can definitely add bloggers here) can make mistakes, hold back information, or just perpetuate food myths which aren’t true and it is in our hand to question them constantly. I really loved the parts regarding famous food people like Marta Stweart and Paula Wolfert which were slightly vitriolic, but so well written, funny and true in many ways and I wasn’t surprised to see his admiration for Julia Child, who also tried not only to teach America how to cook French food but to free American cooks from the intimidating idea of it and to believe in themselves. This is what John Thorne’s philosophy is all about: cooks should be free from the tyranny of recipes, and should trust their instincts. By giving people the means (i.e. information, ideas) to know what to do with their raw materials and by admitting his own failures and weaknesses in the kitchen, he manages to inspire the reader/cook to venture on a path of their own and despite the abundance of recipes in the book, these are merely there as guidelines, rather than to be followed closely. For this CTB I don’t really have a recipe for you. After all I had to be true to the spirit of the book. I took four large portobello mushrooms, chopped them up and added them to my searing wok together with a glug of olive oil and one finely chopped clove of garlic. 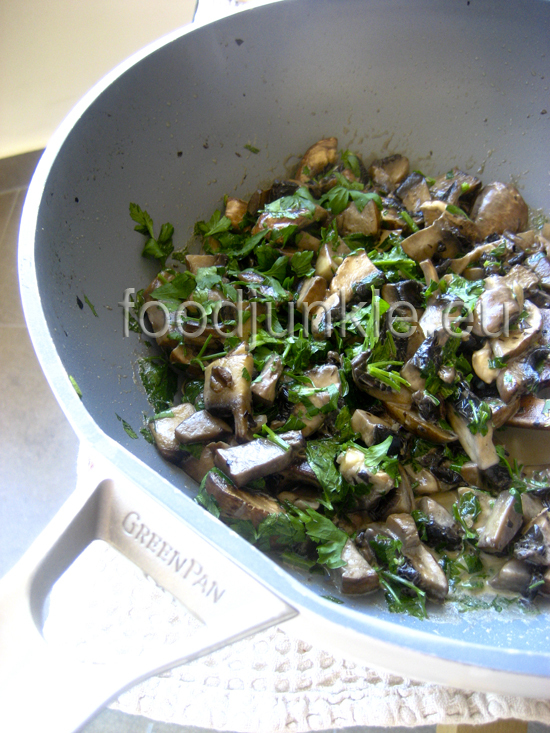 When the mushrooms were nicely browned and no water could be seen in the pan, I added a little cream and a handful of chopped parsley. In the meantime I boiled my 12 oz of DeCecco spaghetti and just before they were done I took two ladle spoons of their cooking water and added it to the sauce. I drained the pasta and tossed them in the wok. Boiled everything together for another minute and finished the dish with loads of freshly ground Grana Padano (parmesan’s sister). This dish took 15 minutes to prepare from start to finish, tasted delicious and I really enjoyed the process of just cooking away. I don’t think I am going to let go of recipes that easily, but as a New Year’s resolution, I will definitely be more adventurous in my kitchen! I love this post—your recipe is definitely keeping in the spirit of Thorne’s writing. It looks delicious! It sounds like a great book! I am sorry I missed this one! Everything everyone is making looks so good. 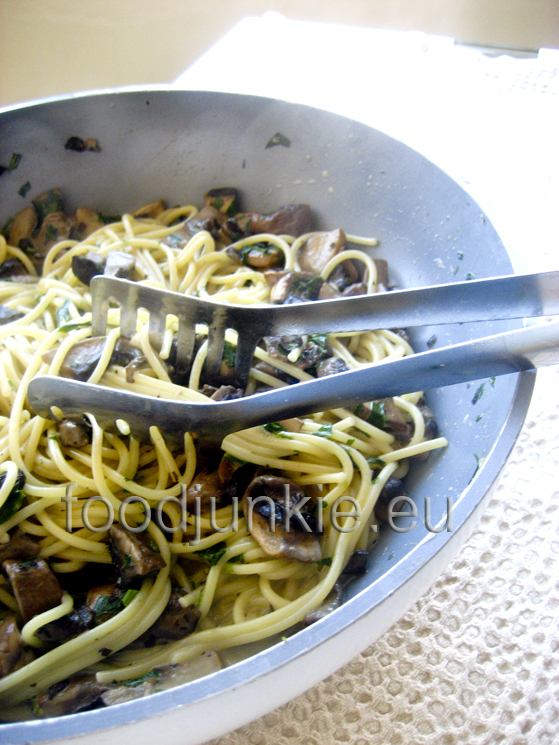 I love mushroom spaghetti dishes. I love your comments about the book and am glad you enjoyed this selection. I am really looking forward to reading the other Thorne books I’ve collected since reading Outlaw Cook. Another great Cook the Books post! Thank you all! I was actually surprised by how good this tasted. My husband devoured the whole thing and told me that it is probably one of the best pasta dishes I have made. He said it reminded him of Italy (he studied in Rome), which is a great complement! Delightful spontaneity and I want to get some portobellos and do that or something similar immediately, if not sooner. Εξαιρετική η συνταγή σου! Τα πορτομπέλο ήταν πάντα ένα αίνιγμα για μένα. Τώρα ξέρω σίγουρα πως να τα μαγειρέψω! Now that is a nice looking mushroom pasta! What a great review of the book. It was entertaining, but also informative (pretty much like the book I imagine). Your pasta sounds AMAZING. The type of pasta (big portions please) that I would eat every night if I could! I can’t wait to try it myself; I’m always looking for fast dinner ideas that taste good. Αγαπητό food junkie παρακολουθώ το μπλόγκ σου και είμαι γενικότερα φαν του στυλ σου. Λοιπόν επειδή μου αρέσουν και οι φωτογραφίες σου και θα ήθελα στο δικό μου μπλόγκ να τις βελτιώσω θα μπορούσες να μου δώσεις 2-3 κατευθυντήριες γραμμές μήπως και τα καταφέρω??? ?